Please join the LEADS Collaborative * team in one of the most colourful Oceanside destinations in the world, St. John’s, Newfoundland for a full day of sharing leadership journeys as well as the exchange of LEADS-based initiatives and tools. 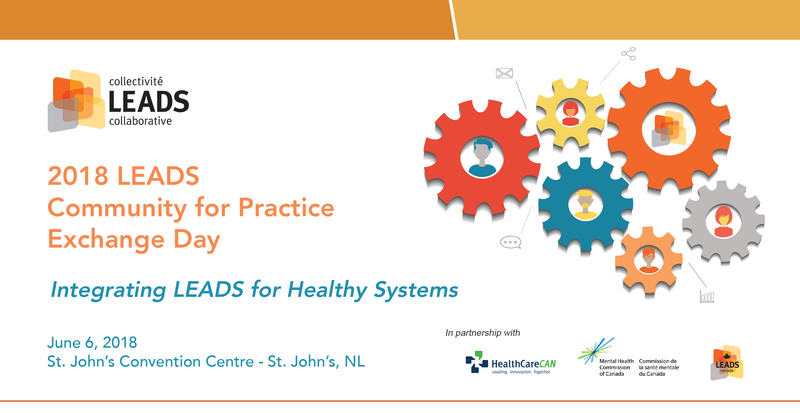 Join health leaders from across Canada who use or are interested in using the LEADS framework for leadership capacity development in their organization. The LEADS Community for Practice Exchange Day will take place on June 6 following the National Health Leadership Conference June 4 -5, 2018. In addition, special attention this year will ALSO be on the leadership aspect of integrating the Mental Health Commission of Canada’s National Standard for Psychological Health and Safety in the Workplace and creating a mentally healthy workplace using a LEADS lens. The event is in partnership with the By Health, for Health Collaborative, a collaboration between HealthCare CAN (HCC) and the Mental Health Commission of Canada (MHCC). Preliminary Agenda Available Soon ! the Canadian Health Leadership Network (CHLNet), Royal Roads University and Dr. Graham Dickson.